The Andean Cat (Leopardus jacobita) inhabit the Andean mountain region of southern Peru and Bolivia to northern Chile and northwestern Argentina. 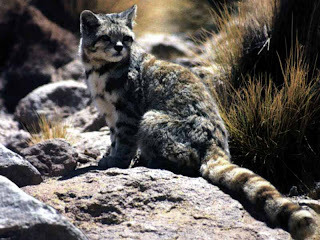 The restricted range of Andean cats may be due to their specialized predation on mountain chinchillas and mountain viscachas, which also have a narrow habitat range in the high Andes mountains. The habitat of this South American cat is very specialized. Andean cats are only known from the arid to semi-arid regions of the high Andes mountains. Preferred habitat is normally above timberline at 3000 to 4000 meters. This habitat is primarily very rocky with scattered bunchgrass, tola bushes, and other small shrubs (Parastrephia phylicaeformis, Tetraglochin alatum, Nassauvia azillaris). They also occur in high mountain grasslands with wet, grassy meadows and various shrubs. Andean cats weigh only about 4 kg. The fur is thick, measuring 40 to 45 mm on the dorsal surface. Body color is pale silver or ash gray with irregular rust-colored spots. The spots are found in a general vertical line pattern along the body. Conspicuous dark stripes extend from the back down the sides of the animal and gray bars also run across the forelegs and chest. The belly is pale-colored with dark spots. The tail is thick and long with six to nine dark brown rings, the tip may be a pale white color in some individuals. The nose and lips are black with areas of white surrounding the edges of the lips, eyes and sides of the face. Also, dark stripes that start behind each eye meet those that run from the nose to the mouth. The spots on juvenile O. jacobita are more numerous and the rings on their tail are much narrower than an adult. As the cats age, their spot number decreases and the color of their coat also becomes lighter. Sexual dimorphism has not yet been observed. Body length ranges from 577 to 850 mm and the tail is about 70% of the body length at 410 to 485 mm. Their auditory bullae are greatly expanded. Andean cats are thought to be primarily nocturnal, though some sightings have occurred during the day. They are very agile when hunting for their primary prey, mountain viscachas and mountain chinchillas. These cats will explore under and around boulders seeking their prey. While hunting, the tail is often held high in the air. 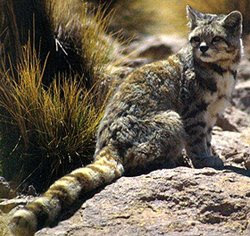 The long tail of Andean cats is important in keeping balance and agility while hunting in rocky, mountainous terrain. From the few recorded observations, Andean cats appear to be solitary and unafraid of the presence of humans. Andean cats are specialized predators of mountain chinchillas and mountain viscachas. However, these cats may eat reptiles, birds, and other small mammals, such as rabbits, and tuco tucos. There are no known predators of Andean cats. However, this animal does possess a fur color pattern that allows it to blend in with its surrounding habitat. 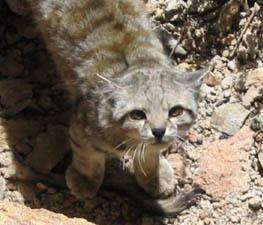 Humans may prey on Andean cats occasionally for their pelts. Leopardus jacobitus is a very rare and elusive cat species. As of 2001, the population size of breeding O. jacobita was estimated to be below 2,500 animals and there are no known subpopulations with more than 250 mature individuals. Leopardus jacobitus is ranked as an endangered animal by the IUCN Red List as well as the U.S. Fish and Wildlife Service, and is listed in Appendix I by CITES. 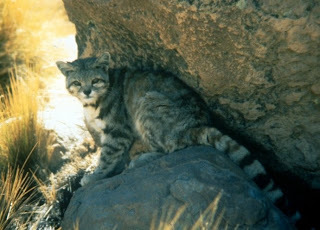 The Andean mountain cat is now protected throughout its geographical range. In Argentina, Chile, and Bolivia Andean cats are protected against commercialization, trade, and hunting by law. 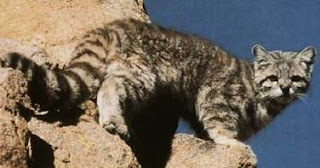 Sometimes considered the least known of the world's cats, Andean cats may be endangered due to habitat deterioration and exploitation by humans for pelts. The declining abundance of their primary prey, mountain chinchillas and mountain viscachas, may have contributed the most to their low population numbers. Chinchillas were once hunted to the brink of extinction and population numbers remain low.